This book gathers together for the first time the editors of some of the most prestigious Translation Studies journals, and serves as a showcase of the academic and geographical diversity of the discipline. The collection includes a discussion on the intralinguistic translation of Romeo and Juliet; thoughts on the concepts of adaptation, imitation and pastiche with regards to Japanese manga; reflections on the status of the source and target texts; a study on the translation and circulation of Inuit-Canadian literature; and a discussion on the role of translation in Latin America. It also contains two chapters on journalistic translation – linguistic approaches to English-Hungarian news translation, and a study of an independent news outlet; one chapter on court interpreting in the US and a final chapter on audio-description. 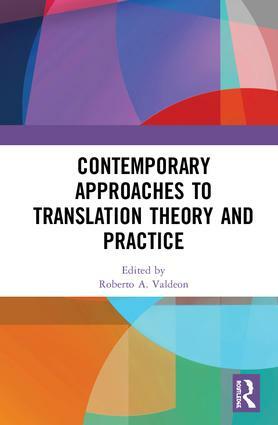 The book was originally published as a special issue in 2017 to mark the twenty-fifth anniversary of Perspectives: Studies in Translation Theory and Practice. Roberto A. Valdeón is Professor of English Studies at the University of Oviedo, Spain, and Honorary Professor at Jinan University, China. He is a member of the Academy of Europe, the Editor-in-chief of Perspectives: Studies in Translation Theory and Practice and the General Editor of the Benjamins Translation Library.